At its heart, the camera unit in the 920 is, as we have established, a fairly standard 1/3" BackSide Illuminated sensor, with Nokia's usual branded optics up front. As you'll see from the video above, the thing that really distringuishes the Lumia 920's video capture is the innovative miniaturised optical stabilisation system - small shakes and vibrations are effectively cancelled out during capture, resulting in a much smoother (and thus easier to watch) result. The OIS works superbly, it has to be said, perhaps surprisingly so - it's amazing that Nokia has gotten such pro-grade hardware stabilisation down to size that it can fit inside a standard (slim) smartphone body. In fact, the OIS works so well that other, expected, small defects in the video capture are made more obvious - in other phones, camera shake often masks other deficiencies. So, for example, there are plenty of digital artefacts in captured footage, bright spots are often 'blown out', there's the occasional bit of odd colouration and the continuous autofocus can be quite aggressive, resulting in frequent attempted changes of focus. This latter is particularly noticeable since the whole scene appears to zoom in or out slightly as the adjustment is made. But I don't want to be too negative - overall raw quality is competitive with video from the likes of the iPhone 5 and Galaxy S III, yet with the advantage of OIS to make the footage smoother - in short, video capture on the Lumia 920 is the second best I've ever seen from a phone. The top spot, of course, as with stills, remains with Nokia's own 808 PureView on the Symbian platform, which has a dramatically larger sensor, and a massively powerful image processor to work its magic, in video mode as well as with stills. One big disappointment for me personally was that the full resolution of the Lumia 920's sensor wasn't used to its fullest in video mode. Now, this is also true for much of the competition, but I'd got very used to Nokia's top camera-centric devices shooting video with intelligent digital zoom, i.e. allowing zoom up to 3x with no loss of quality by allowing the full native resolution of the sensor to be used and cropped in on. This technique was introduced on the Nokia N86, refined in the N8 and then again in the 808 and it seems almost criminal not to have used it here as well. Instead, you can zoom in on a scene on the Lumia 920 (by using a pinch/splay system on the touchscreen) but you're merely blowing up portions of a standard 1080p capture, so everything ends up looking very blocky. Again, this is in common with most of the non-Symbian competition, but it's still galling to know that Nokia could have gone the extra mile here. One common feature that the Lumia 920 shares with its Symbian 'PureView' counterpart, the 808, is Rich Recording, Nokia's name for its refined system of HAAC (High Amplitude Audio Capture) when shooting video. Again pioneered on the N86 on Symbian many years ago, with the introduction of MEMS digital microphones, and again refined in the N8, which had two of them, the 808 added custom audio electronics to be able to handle a fantastically wide range of volumes, from the tiniest bird tweet to the loudest rock concert, jet plane or (in the clip above) steam train. The 808 could perform this 'Rich Recording' in stereo, but the Lumia 920 currently only records in mono - it's felt that this might be a software limitation though and that full stereo capture might be unlocked in a future firmware update - let's hope so. Hearing the system in action is jaw dropping - point the Lumia 920 (or 808) at the very loudest rock stage or plane or train and the finished audio track will be, quite literally, perfect. From the deepest bass guitar notes to the highest cymbal sounds to the plane's whine or the train's steam, all are faithfully represented in extreme quality. In contrast, every other smartphone in the world - and a great deal of consumer camcorder equipment - produces an ugly, distorted audio mess. Appreciating Rich Recording in action is not a matter of being a Nokia enthusiast - it's a matter of fact and there are hundreds, if not thousands, of 808-shot (and now 920-shot) rock concert video clips online as proof. As covered in part 1 of this review, the screen colours and contrast are wonderful on the Lumia 920, and these play a beneficial part when considering shooting (stills or) video - it's a pleasure to line things up and keep an eye on what's being captured. The interface is slightly simplified from Windows Phone 7's camcorder interface, in that there are no on-screen 'zoom' controls, but it's still very recognisable. A large fonted clock reminds you that you're in video mode and thankfully dims significantly when capture is in progress, though you can still see at a glance how much footage has been shot so far. Video capture can be initiated using the hardware shutter button or by just tapping on the display, which proves surprisingly useful. Control icons to switch back to stills mode, to switch to/from the front-facing camera and to toggle the LED video light are all evident and obvious. Rather more curious is the icon to switch to one of the Windows Phone 8 'lenses'. We'll cover each of the lenses in its own mini-review shortly, but it's odd to find access to these still photo-based camera functions in the interface for the camcorder in the Lumia. As usual with Windows Phone, any changes you make are a one-time-only affair unless you actively 'save' the settings. 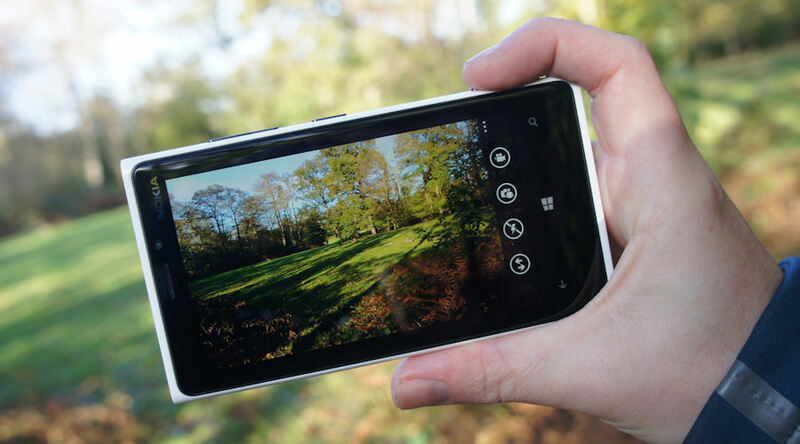 Overall, then, a qualified thumbs up from me for the Nokia Lumia 920's video capture facilities. Quality is pretty good, the OIS and Rich Recording work brilliantly and the interface is functional. And, as with stills quality, there's every likelihood of improvements in the near future, as the firmware is refined, not least to perhaps introduce stereo audio capture. In the next week or so, we'll be reviewing the wider Windows Phone 8 interface and application set, plus I'll be delving into the various Windows Phone plug-in Camera lenses in detail.